Conventional nets, as we know them, are knotted and hard with very little flexibility. This poor design will in most cases remove the protective coating and scales of fish when they are removed from the water. On the other hand, modern landing nets come equipped with a soft, fish-friendly mesh that is knot free. The arms of the net can either be collapsed or removed, separating the net from the extended handle. This allows you to roll the net up snugly against the fish before removing it from the water, preventing unnecessary damage during the moving process. Before lifting the fish, always make sure that the fins are neatly tucked underneath its body and support the fish's body weight as much as possible. Also, make sure your footing is secure, especially on sloped banks or rocky terrain. Available in many different shapes and sizes, ranging from a simple mat to a collapsible cradle, they all serve a crucial purpose, providing a barrier between the fish and any potentially hazardous objects. Carp can be extremely unpredictable, and we need to take the utmost care in preventing any cuts and scrapes, scale-loss, or worse, internal damage to the fish. Keep your landing mat well soaked at all times when handling fish. Under no circumstance should you place any fish on a warm, dry landing mat. Keep a bucket of water on hand to cool down your catch on a regular basis. Find a smooth and level surface to place your mat. It will prevent the fish from sliding off should they begin to misbehave. Never leave any fish unattended, EVER! Cover the fish with a wet net should they get rowdy, give them some time to settle down. Handle the fish as close to the ground as possible. Never stand up while holding your catch; it’s irresponsible and extremely dangerous. Use your landing mat or weigh sling to transport you fish safely back to the water. Always remove any jewelry from your wrists and hands before handling the fish. 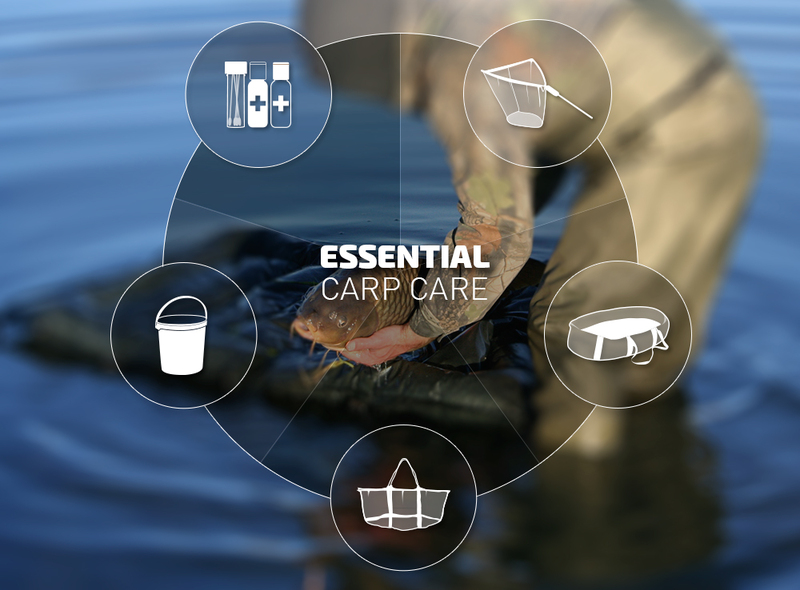 The water bucket – an essential part of your carp care kit. Never leave home without one, keep it close and topped up with water. A quality weigh sling will support the fish's weight and provide a moist and snug environment during the hoisting process; making the task at hand much easier. It needs to be strong and without any tears. Some slings offer a floatation option to retain the fish in the water while you organise yourself on the bank. Keep it well soaked at all times. Never place a fish in a warm or dry weigh sling. Double check that your weigh sling is smooth on the inside and free of any debris. Always make sure that the fins are neatly tucked underneath the fish before hoisting the fish for weighing. Keep it zipped up if this feature is available. Use your weigh sling in conjunction with your landing net for lifting big fish out the water. This will prolong the lifespan of your net and give added support to the fish. These nifty kits consist of cotton buds and antiseptic treatments. Fish often sustain injuries and other trauma when caught, whether the damage was caused by hooks, line or by snagging or bumping on natural elements. Carp care kits are essential in aiding the healing process and preventing prolonged damage. Take your time when inspecting your catch, treat any visible wounds (hook damage in the mouth, missing scales, cuts) and safely return your catch to the water. Remember, taking proper care of your catch today could help someone else land their dream fish tomorrow. We would love to hear from you, so please email your tips and advice to info@carpfever.co.za alternatively post your comments below.